I recently got a “people pay” payment from someone who uses ByLine bank. ByLine bank is a local Chicago bank that uses a web based banking services from FIS Global called ibanking. We’re sorry, but the system is currently unavailable. Please contact customer support. Which I did, and saw that the domain name was for sale! I triple checked the spelling with the representative. He said to call back during business hours the next day. How can they be giving customers invalid URLs? I called today, and was told numerous times they could only help the customer who sent the transfer. How can they not support the person who received the payment? They are both using the same system! The person who sent the money is not having the problem. While on the phone with the agent, I realized that the link looked to have a variable, but that variable didn’t have a variable name, or even a question mark (?) indicating the beginning of the variable part of the URL string. I removed the variable data, and the link worked! I was able to solve a problem in 2 minutes, which 3 people at the software vendor were unable to do in over an hour. In fact, the support I got was wrong! They are lucky the domain name was for sale, and not phishing customer data! I asked to report a bug, but was unable to do so, since, I’m not a customer! Thinking I could file a security breach bug, and that would make it to the right people, I asked to do that, and again, I was unable to do so, because I was not a customer. I pretended that I could access a customers data, and that vulnerability should be filed, but I quickly fell out of the representatives process, and was unable to even file one of those. Truly unbelievable. A bank that is relying on an incapable 3rd party software provider to handle the majority of their customers interactions and transactions. A long while back I built a ZOTAC Zbox (ZBOX-CI323NANO-U) to run PFSense and act as my router. For the most part, it has worked pretty well. The features are great, without any of the gimmicky stuff you’d find on a consumer router. It’s also a lot more upgradable than a consumer router. Each time the error occurred, I would hunt around the internet for a few minutes to find a solution, but I was never able to find one. I gave up for a while. But recently I took a deeper dive. I found some pages blaming the default network adapter drivers and how they don’t work well with realtek adapters. I also found this page announcing new realtek drivers. I’ve dabbled with Linux a bit, but I’d still consider myself pretty novice. It was pretty difficult for me to get the drivers copied over to the machine, and then installed. My home network is pretty advanced. I have a PFSense home-built router (based on Zotac ZBOX CI323) that connects to my modem, several smart switches (Netgear JGS524E), and 2 wireless Access Points. The two access points are both made by Zyxel; an NWA1123-AC and an NWA1123-ACv2. I thought it would be prudent to upgrade the firmware of both devices this week but ran into a problem. Since both need different firmware, I first downloaded the firmware for the v2 device, and then did the v1 device. Somehow I managed to download the NWA1121-NI firmware for the v1 device, and then applied it. As I was doing some configuration on the device, I saw I was missing the 5 Ghz settings, which lead me to figuring out I had flashed it with the wrong firmware. I thought it would be easy to revert back since I was able to go one way, but that proved wrong! The device wouldn’t accept the correct firmware. I did some hunting around the internet, gave up quick, and submitted a technical support request. Zyxel got back to me the following day saying I would have to RMA the device, sending it back to them, assuming it was in warranty. After some following correspondents, it was determined that I was out of warranty/support. I turned back to the internet. I found, on Zyxel’s website (PDF), they had directions on how to have the device pull firmware from a TFTP server before the router fully booted. However, there were some critical steps missing. There’s no serial port on the AP; WHAT? How do I unzip a bin file? And how do I unzip what comes out of that? What software do I use to TFTP? What software do I use for a terminal? Zyxel support insisted that this KB article on their site did not apply to my AP problem, and there was no way I could recover the device without sending it in to them. I did some more hunting and found someone over at the OpenWRT.org site posted the internal parts of the NWA1123-AC AP, as well as some serial port details. I also found a page for serial port specifics saying I needed a USB TTL adapter. The same page had details on the pins to connect the adapter to on the AP (see: Router with serial port / header / pins). Turns out Amazon and my local MicroCenter both carried a USB to TTL adapter, for use with RaspberryPi devices. I biked over to MicroCenter, and picked one up. Once I got home, opened up my AP, connected everything, downloaded and set up Tera Term and TFTPD64, and starting going through the KB article. I used 7zip to extract the contents of the bin file, and the contents of the subsequent file. I ended up with the files shown in the KB article, so even though 7zip said there was extra contents that wasn’t extracted, I figured I was on the right track. Everything seemed to work great, and got my device flashed with the correct firmware! Sadly, Zyxel’s poor design required me to clear my browser cache to get the AP’s config page working correctly, but if that was the only hiccup, I wasn’t too angry, and I had been stupid enough to flash the wrong firmware on the AP in the first place. Access Point saved from certain death! For several months I have been getting the message in Outlook 2010 that there was no PDF Handler. I decided to do something about it today. I tried for about an hour. One of the steps I took was to “repair” Office. That required me to restart my computer, something I seldom do because of how long it takes to do so, even with a Core i7. The repair didn’t solve anything. One thing I read online was to go into Adobe Acrobat reader and make sure some check-box was unchecked. When I opened it up from the start menu, it starting going through some finalizing installation steps. That seemed strange since I have been opening PDFs for some time now. I guess opening it directly is slightly different than opening the program by double-clicking a PDF file. I got to the check-box and it was already unchecked. I opened Outlook again, and my PDF Handler worked! Apparently all it took was opening Adobe Acrobat Reader XI from the start menu. What a crazy simple fix! I have had an Oracle Service Request (SR) open for 3 years now. 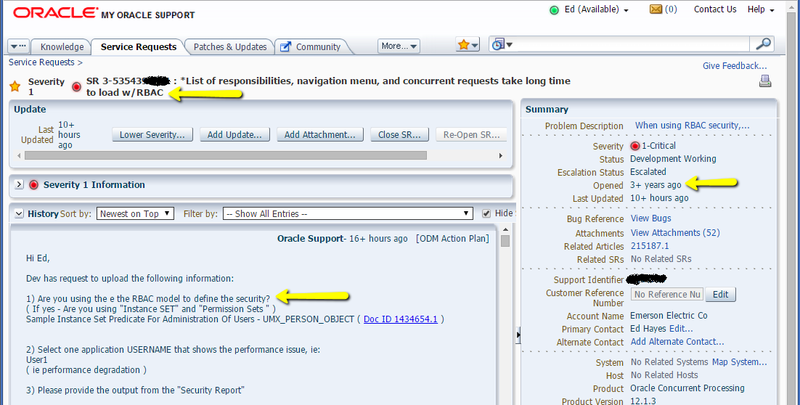 The request has to do with how slow several security based objects are to be displayed when a user is set up using Oracle’s newer RBAC (Role Base Access Control) security structure. Right now we are working on is the list of concurrent requests. The SR was originally opened as a severity 2. About a year into the SR, one of my DBAs had some work to do on it and was getting poor response from Oracle support, so he raised the severity to 1. It has been at severity 1 for about 2 years now. I have gotten several patches from Oracle. The first one we applied showed no change in performance at all. When they released the second patch, I insisted they provide details of what the improvement was so I could confirm A) it actually did improve, and B) they have actually replicated the problem internally. I didn’t want to waste our DBA team’s time applying an alpha stage patch that has been untested. I never got the proof that the patch was tested. I gave up and had the patch applied. The patch broke the security all together; a user would have no access to concurrent requests at all. Yes it was fast, but it didn’t work. A third patch was released; it fixed the security, so at least the user would get access, but the performance was 50% slower than an un-patched system. For several months I have been asking for updates on the SR every week or so, and it get the standard “we are working on it” or “requested status from development” response. Note in the title of the SR I mentioned “W/RBAC.” The first question in this SR update is “Are you using RBAC model to define security?” ARE YOU KIDDING ME?